Things seem to have a domino effect. The hot selling of Apple iPad makes iPad-related software become a hot cake. A case in point, DVD to iPad converter, free or paid, reaches a fever pitch unprecedentedly. Generally speaking, people are usually reluctant to spend money converting DVD to iPad since they've already paid for the DVD movie once. As a result, the free DVD to iPad converter is more preferred. To be honest, if you search Google, you will be overwhelmed by a mass of DVD to iPad converter freeware. Instead of installing such software on your computer blindly, the following questions (if you keep in mind before downloading it) can avoid the DVD to iPad conversion in vain and help you get the desired result. * Shall I get a DVD ripping freeware offered on the website devoid of annoying pop-ups, ads, spyware or malware? * Is the program up to par? Or can it stumble over the newer copy protection schemes when I rip DVD to iPad? * Can I find a free DVD to iPad converter that gives me an amazing video watching experience rather than worrying about disgusting watermark left on the converted video? Actually, chance to find a safe, fast, easy-to-use yet free DVD to iPad ripper is slim. Well, don't lose your heart. Here this MacX DVD Ripper Mac Free Edition comes as the silver linings, which takes contents out of DVD (even they are bogged down with CSS, Sony ARccOS, etc) and converts them into a format that is readable by your iPad (iPad Pro/mini 4/Air 2, iPhone 6S/6S Plus, iPhone 7/7 Plus/X/8/XR/XS etc). Another pleasant experience when using this tool is that you can enjoy an ultrafast, high-quality, clean yet free DVD ripping process on Mac computer, with no time limit, no ads, no virus, no watermark. Download and install the free DVD to iPad converter on Mac OS, click "DVD Disc" button on the upper left part to load DVD. Or you can also load DVD folder by clicking "Path" button. The free DVD ripping software will automatically detect the right title of your new DVD movies with copy protections. In order to free rip DVD to iPad on Mac running system, you can select MP4 for iPad or directly hit "to iPad" as the output format. This program also excels in ripping DVD audio to MP3 music for different MP3 players. Set a path to save the ripped DVD on your Mac computer. After finishing the above steps, hit the "Start" button and start to transfer DVD to iPad on Mac OS X, you could view the conversion progress and are able to cancel the converting process at anytime. 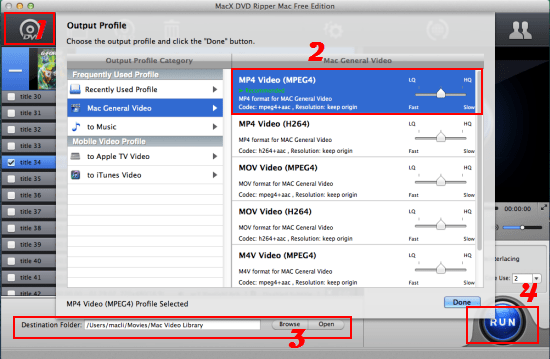 Tips: This free DVD ripper for Mac brings Mac users plenty of options, where you can trim parts of DVD movies, stretch the video to full screen, and customize the output video by adjusting the video size, video frame rate, altering the audio and more, to better fit your iPad. If you are interesting in more DVD conversion, the paid version MacX DVD Ripper Pro is up for your needs, skilful at making a 1:1 copy of DVD and ripping DVD to MKV, MOV, MP4, M4V, MPEG, H.264, FLV, AVI for any generation of iPhone, iPad, iPod, and other portable media players such as Kindle Fire HD, Samsung Galaxy S7/Note 5, HTC etc. After you ripped DVD to iPad compatible video formats, you can only enjoy your beloved DVD movies on Mac/Windows computer. To finally watch DVD movies on iPad, you need transfer DVD movies to iPad with the help of an iPad transfer - MacX MediaTrans. It's proficient in transferring movies from Mac to iPad, no matter your movies are iPad compatible or incompatible. It automatically converts videos to iPad iPhone video format during the transferring process. This review will introduce top three best yet free DVD to MP4 converter Mac for you to easily rip and convert DVD to MP4 without cost even a nickel.